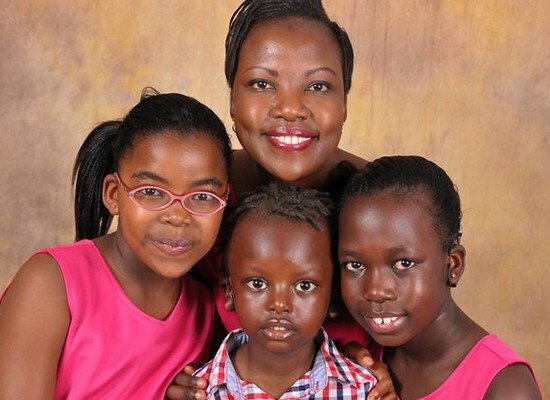 By Jackie Oduor, a mother from Kenya of four children – three with severe to profound hearing loss. We were blessed with our first child in 2006. I had a normal pregnancy and birth. It was only at two years, we noticed that she wasn’t developing much speech. I compared her with other children of the same age and was asking around but people reassured me that there was nothing to worry. So I enrolled her to a playgroup. Two weeks later her teacher told me that they think she did not hear. I was in panic and my husband made an appointment for a test. The weekend before the appointment we noticed that she did not respond to many environmental sounds which made me worry. At the appointment, the pediatrician did some basic sound tests and referred us to an audiologist at the hospital. I did not know what an audiologist is but we went there for an auditory brainstem response (ABR) test where with hardly any information our daughter was put asleep. When she woke up, the audiologist broke the news quite casually: she was severe to profoundly deaf. Again there wasn’t a lot of explanation, just the advice to buy hearing aids. I was shocked while my husband tried to be strong. I asked myself what happened? Did we cause it? We informed our relatives and their responses were quite something: ”This will sort itself out. Don’t get her hearing aids; they will mess up her ear drum. Take her for prayers, take her for a second opinion. We went to another ENT who confirmed the results. We managed to raise funds – the insurance only contributed little, and went for the fitting of analogue hearing aids which weren’t the best solution. Our daughter struggled with the whistling of the hearing aids. Another struggle was to find a speech therapist. The cost was too high and we felt we were not advised well and so we started to look online and were overwhelmed by the good information from developed countries. On www.hear-the-world.com I read about new digital hearing aids from Phonak and I took a step of faith and wrote them to seek help. We were so happy when Ora Bürkli responded that they were willing to support my daughter with hearing aids at a subsidized rate. There were many times on this whole journey, I struggled, I felt alone and I felt intimidated by the constant questions from people around me. There were days, I hid myself from my daughter so she couldn’t see my tears. I thought, if the situation is that hard for me, how must it be for her? I worried about her future. I promised I would do everything I could do for her. So during her therapy sessions I tried hard to learn to best support her at home. Due to the taboo, sign language was not an option for many, as everybody would immediately see the disability. These were only a few of many stories they shared at the meeting and in the evening back home I was thinking about what could I do to assist them. So we run a school in Nairobi trying to mainstreaming children with hearing loss. The start wasn’t easy. Some parents were our biggest obstacle, as they did not want their “normal hearing children” to become integrated with ours – again due to the fear of being stigmatized. But today I am proud of what we achieved, although there is still much to improve. In the meantime, everything seemed to be fine until 2010, when I became pregnant. It wasn’t planned at all and I was worried about my baby to be born with the same disability. In March we were blessed with a healthy boy. As there was still no newborn hearing screening, we had to wait until he was two years old to find out that he was severe to profoundly deaf. My world shattered. Why my children? My in-laws sidelined with the kids but my husband supported us and was an amazing father. Sadly he died in a road accident in November leaving me alone with three children. In November 2016, the children home contacted me. They had a little boy with hearing loss and needed guidance on how to assist him. I decided to take him to our home. It has not been easy but he is making slow progress and we are celebrating every small milestone. Many people thought that I am crazy to take on another child with hearing loss but he and all our children are a blessing. For many parents it is hard to know what the right way of communication is for their children. My advice to them: Try it out and what works best for your child, is what is best. And whatever option you choose, make sure you advocate for your child to reach its highest potential. I myself have reached out to the signing community and I am learning to sign with my children to see how we can best work and develop together.